Vietnam teaches children how to program computers in elementary school. This article points out many ways and reasons Vietnam provides much better education than the USA. An important point is that learning to program computers is expected of everyone in Vietnam. In the USA there is a stigma against students who are “too smart” and athletes are praised and have lots of money spent on them. Vietnam and Asia in general views being smart as the highest status and athletics as a hobby at best. I suspect that also contributed to overall better health among Asians because athletics isn’t a hostile exclusionary clique. Its just something people do for fun. Due to a lack of funds, the school could not afford two CS teachers, so half the school was unable to take CS. I asked what a teacher’s salary was. $100 per month. So I went to an ATM and bought them a second teacher for the next year. When you see fabulous results then people are glad to freely support it. Even more so when it costs less than a cup of premium coffee. Charity, proof scarcity doesn't always increase prices. November 2, 2012 · Posted in abundance, economics, sharing · Comments Off on Charity, proof scarcity doesn't always increase prices. Economic theory states that scarcity increases prices; but, exactly the opposite occurs. 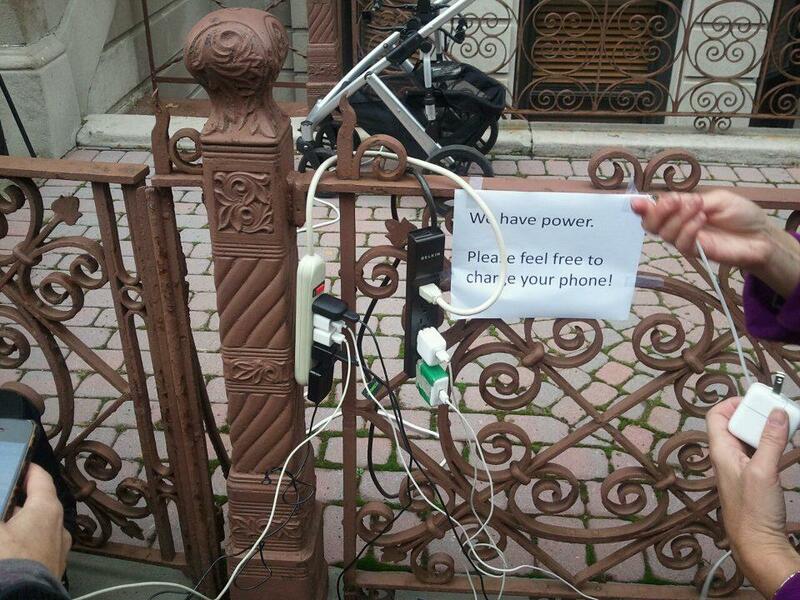 People share with their neighbors. Widespread power outages is the definition of scarcity. The people people without electricity clearly have a need. Why didn’t it lead to massive profit taking? In a real free market there is another choice, it’s call charity. The person sharing their electricity didn’t have a scarcity, they had an abundance, more than they needed. The value of helping people in need outweighed any monetary profit or the hassle involved in selling access to electricity. This situation shows that given the choice people gladly share. If there isn’t a significant cost involved sharing people will share. Some people claim wealthy people must be forced to provide for the needy. Logic and evidence show that is false. Charity is always freely given, and that is often. 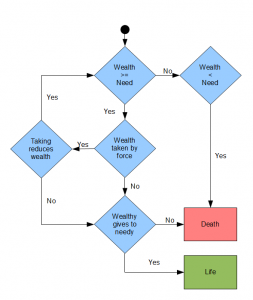 This flow chart shows both freely given charity and forced redistribution of wealth. Before we begin what is “needy”. A person is needy if they do not have the items to maintain their natural life. So far human technology is not capable of eternal life, regardless of the amount of physical wealth. We are all needy at some point. When we are born we are not able to provide for ourselves what we need to continue our lives. So all of us were needy and had that need filled by someone else at some point in our lives. How did that process of being needy and someone deciding to give us what we need work? 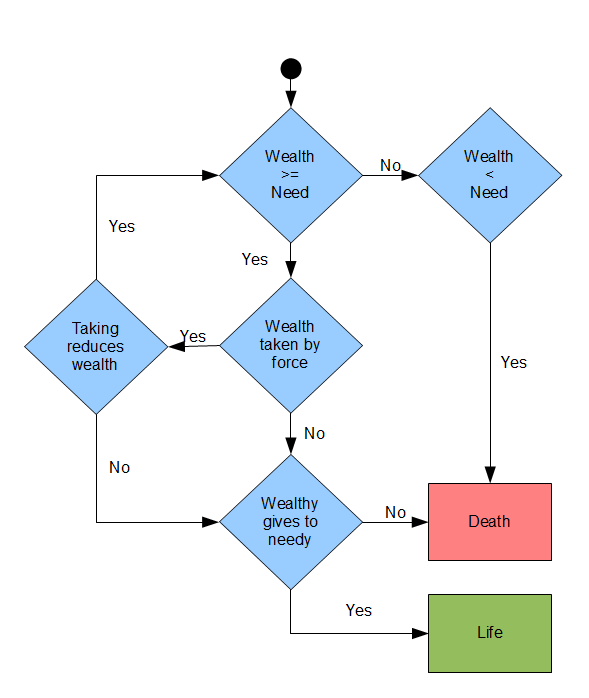 Step 1, is the total wealth more than or equal to the total need? That means is there any extra to go around? If there isn’t any extra to go around it doesn’t matter, someone will die. It might be the needy or someone else who becomes needy by giving what they have to someone else. If there isn’t enough for everyone to live then someone dies. If possible we want to avoid that at all costs. If there is extra there is a choice, is the wealth taken by force? If that happens there is now a new wealthy person. The person who took the wealth is now wealthy. Additionally, taking the wealth by force might reduce the wealth. Fighting to take something from someone who doesn’t want to give it requires some energy and frequently breaking things including killing someone. Just for argument sake we will assume there is also a way to forcibly take wealth from someone without spending any wealth in the process. If taking the wealth by force reduced the wealth there is a possibility there is now not enough to go around. That is very common. Civil wars in particular leave many people in poverty and starving even if the nation was prosperous before the fighting. Assuming taking the wealth by force does not reduce the wealth leaves us at the same point as if no force had been used. The original owner of the wealth or the new owner who took it by force decides to give the wealth to the needy or keep it. So it doesn’t matter if force was used or not. The life and death of the needy still depends on the free choice of the wealthy person. The logic shows that charity is always freely given. People who argue for using force says, “I’m afraid wealthy people won’t give to the needy. There is no guarantee.” That is absolutely correct. There is no guarantee. There isn’t any guarantee without force and there isn’t any guarantee with force. As long as there is anyone who is needy, it is impossible to guarantee their needs will be provided. We’ve already shown that using force to redistribute wealth has the risk of decreasing the wealth and making the needy worse off. The solution to the problem of the needy is to create more wealth. So the logic shows there are two ways to provide for the needy, freely given charity, and increased wealth. Does the evidence agree with the logic? Yes! The nations with the largest number of needy people, the highest percentage of needy people, and the deepest need are those that are overall the poorest. The wealthiest nations have no truly needy people. There might be people with drastically less wealth than others but except for people willfully rejecting food or shelter there are no starving people in the industrialized nations. The individuals of wealthy nations either have many opportunities to acquire their own wealth by trade, working the soil, or gifts. There are even people who call themselves Freegans who choose to live from things discarded by others and Freedans claim to live quite well. Freeganism is not to be confused with impoverished people struggling to subsist scrounging from dumps. It’s worth pointing out that one of the reasons there is so much for Freegans to pull out of dumpsters is because of government forced waste. Wealthy nations also give amazing levels of charity. In the USA the amount of charitable giving $295 billion exceeds the amount of federal government tax funded welfare $254.2 billion. Not only do people give to charities to help the needy, they also donate to fund projects they like. Contributions to make a movie about the making of the video game Minecraft raised $60,000 more than the $150,000 they requested. Monetary giving isn’t the only form of charity. Millions of people donate food, and labor to organized charities and directly to individuals. This is over and beyond the monetary giving. So we can see that the logic proves and the evidence confirms that charity is freely given.